Some years back when 2GO was still ATS (Aboitiz Transport System), the Philippine Ship Spotters Society (PSSS) had a tour-meet in Cebu and as usual many of its leaders came from all over the country. We had the usual tour of Cebu Port, Muelle Osmena, the Mactan bridge, Ouano along with some shipyards. Part of the meet, of course, is the usual talks and camaraderie and that will include some eat-all-you-can stuff. And over the years the favorite EAYC place of PSSS became Joven’s in Parkmall. The restaurant became the respite of the group when it became overheated and fagged out. Ship spotting not only needs sturdy legs but also liters of fluids and sustenance after all the trying efforts under sun. In those days I was still staying in a hotel and I usually choose one which is near Cebu Port for convenience, of course. It was easy to walk to the pier area and take shots even if alone. Usually, there is also a vantage point in the hotel where one can take shots. Members will visit me there if free for some talks and friendship. Plans are also hatched and in this tour the fiesta of Tagbilaran was vaguely mentioned as a Moderator who is Vinze Sanchez will be going home for the said occasion. While having a rest in the hotel, I received a text message asking if I was interested in going to the Tagbilaran fiesta together with some members. I said “Why not?” although my mind was a little foggy. I was unbelieving if it was possible as the fiesta is already on the next day and it is part of lore that rides to Bohol are so full during summer especially on fiestas (and that even includes the buses from Manila). I also remember that when a former Japanese member of PSSS wanted to tour Bohol on a moment’s notice that he had to call a very high-ranking Aboitiz scion for intervention to be able to secure a ticket. And it took him many hours even though that Aboitiz scion had the rank of Vice-President, if I remember it right. I then went back to sleep thinking my schedule will be unchanged. Not long after I was awakened by another message telling me we already had tickets in SuperCat. I was in disbelief as we were an additional four excluding Vinze. I was thinking, “Holy cow, how was Vinze able to pull it off?” when the Japanese group was only two. And now we will be five in all, all in one catamaran and on Vinze’s exact schedule. I was amazed but suddenly I remembered that Vinze has an access to the SuperCat reservation system (I can tell this now as the SuperCat situation already changed over the years and Vinze no longer rides the SuperCat regularly as he is now abroad). As they say in Systems Operation the weakest link is the human link and Vinze had an trump card on that. And so we went to the SuperCat terminal and frankly I was expecting a hassle of some kind (to me our trip seemed too good to be true). However, there was no hassle whatsoever, only smiles from the employees that know Vinze and that included his friend who rigged the system. I can only shake my head at the thought that a few people won’t make it to their fiesta as they had been bumped off. I felt pangs of guilt as they would have been too disappointed and will be scrambling to get another ride. I know the usual spiel. “Overbooking”. Now I realized that regular “pasalubongs” and “pakikisama” go a long, long way. Upon boarding SuperCat 26 we only put our bags in our assigned seats and forthwith we proceeded to the catamaran’s bridge. I saw a white man who got startled. I also saw another white took notice of five men in a procession to and opening the door of the bridge which is officially off limits even to most of the crew. I know what was on the head of the startled whites. “Hijack!”. We as a country are notorious after all in the Western embassies’ advisories. We were soon in the bridge of the catamaran and Vinze introduced us to Captain Sunga (he is not working locally so he is safe), the co-Captain and the Chief Engineer. They were the three officers occupying the bridge and there were only seats for three. The seats had belts and with armrests and it looked comfortable. The Chief Engineer was monitoring the engines through a CCTV and through instruments and controls in the bridge. No need for a command to the engine room. Joysticks were in command of the ship from the speed to the direction. However, a bridge designed for three was a little jampacked for eight people and I was glad the cat’s officer bore with us. It was of course illegal to stay on the bridge and it violates the operations manuals. However, in our country friendships go a long way. I heard about the simulator given by Vinze to the Captain which is not only entertaining while waiting for the next trip but improves maneuvering skills, too. We were given an introduction of the bridge system and its instruments, its functions and how it helps the bridge officers. We were a little piqued with what is showing in the radar. The SuperCat was designed after all to operate even in nighttime. I noticed that as the craft sped the Captains always jerked the joysticks but I failed to ask why. All through the voyage we bridge visitors were in standing position but we enjoyed it. Anyway, how often would one be treated to a “Bridge Class” accommodation and a whole group at that? It was also enjoyable to watch the views come and pass by in a bridge. It was really different compared when one is in the passenger compartment. Besides we were able to ask a lot of questions enriching our knowledge of cats and of the routes. Tagbilaran port came and we had to bid goodbye to the officers. Some of the passengers had an askance look at us. It is maybe because they noticed that five seats were vacant throughout the voyage and it was too noticeable in a full-packed small craft and probably they asked where were we or they noticed where we went. I don’t know if there was a tinge of envy in the looks. For me personally I was a little ashamed. I do not want such attention when I receive some special privilege. Maybe I am already too old for bragging rights haha! We arrived the night before the fiesta and we just idled and talked the night away, If there will be a tour of the city during the fiesta itself I found out it was not in the works. No parades or spectacles but just plenty more of stories and camaraderie. Of course we met Vinze’s kins and we ate at the home of the No. 1 Councilor of Tagbilaran (we saw him again in Vinze’s wedding). The food was sumptuous and I took a liking for the lechon which is actually not a good food for my health. I ate a lot and my companions noticed and ribbed me for it. I did not care as I was simply enjoying the trip. If I had a worry it was our trip back but I kept quiet for the moment lest I ruin the fun. Our group was an eclectic one. If Vinze is from Bohol, I was from Davao and three were from Manila (one had Bohol origins and two had Mindoro origins but I noticed all three had doctor parents). But we are all friends now and we really wanted to experience the Tagbilaran fiesta. These meets are where we get to know each other well and where true friendships are forged. We did not stay another overnight in Tagbilaran. We actually wanted to take the last ferry out of Tagbilaran, sleep in it and save on hotel expense (the fare was more or less equal to an single aircon hotel room). We were all on a budget and this was the wise course. 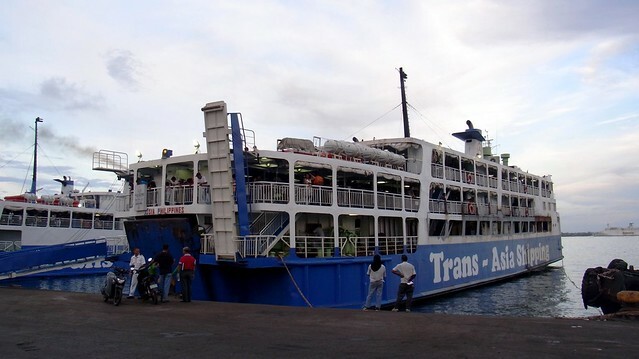 The ferry leaves at 10pm and this was the Our Lady of Barangay–1 of Lite Ferries which has a sleeping accommodation. We thought it was perfect for our “pagtitipid” (which is skimping like what is done by backpack travelers). Imagine a “hotel room” traveling at sea. That was what our ride should be. However, when we arrived in Tagbilaran Port there was a problem. The ferry was fully booked, the Lite Ferries ticketing office at the pier said. But having been a traveler for almost all of my life I knew it was not an impossible situation. There had to be a way, there had to be a vacancy because not all that reserved tickets and not all ticket holders would show up especially since it was a fiesta and people forgets the time or are held up. The only question in my mind was if there were enough bunks. I was prepared in any way to just sit up in the ship somewhere as long as we are able to board the ship. And so we begged the Lite Ferries people and camped in the port terminal building. While camped in the empty terminal we were actually in good spirits. Just before departure time we got the signal that we can board. I saw my companions perk up. Aboard the ship we were herded to Business Class which was located on the lowest passenger compartment near the bow of the ship at the car deck (and so the sloshing of the water is audible). There were benches there. And so i thought there was where they accommodate overflow passengers. They told us to wait as they will check which bunks were empty. It was obvious to my eyes there were some empty bunks. The question is if we can be all accommodated in Business Class. I saw that the Tourist Class was full and a little crowded. The Purser counted. Yes, we can all be accommodated in Business Class and the Purser proceeded to issue us our tickets. It was cheaper than an aircon hotel room which was a good deal as were traveling at the same time, we had a bed (a bunk really) to sleep on and with linen (which they call “beddings” aboard a ship) to boot. I noticed early that the air-conditioner of the Business Class was too cold but that was the least of my worries. I just wanted to sleep as I was tired and a little stressed by the ticketing/boarding hassle which was no fault of the shipping company. Our ship arrived in Cebu at dawn as expected after a six-hour voyage. I told my companions there was no need to disembark early. We have no hotel rooms to go back to anyway and our ship accommodation was a perfect waiting area. Cebu overnight ships are gracious enough not to wake the passengers early and they let their guests which means the passengers continue their sleep until there was enough light. I had also another idea why I don’t want the group to get down early. We were inside the port premises and because of ISPS (International System of Port Security) one can’t get inside it unless one is a passenger. My idea is since we were inside already is we will take the opportunity to ship spot at first light and I know the guards won’t really be in a position to challenge and shoo us away. When the first light was breaking there came the Lady of Angels of Medallion Transport coming in. Soon after she docked the passengers and the vehicles came down, of course, and it was a good ship spotting opportunity along with some other ships passing by. We were then between Piers 2 and 3 of Cebu Port. When the port was already bathed in light I told the group we better board a docked ferry because if we don’t the guards will see and challenge us. Aboard a ship it is only the Captain which can challenge us and to Captains of small ferries of small shipping companies “gate crashers” are the least of his worries. Some are even glad there are people who visit and appreciate their ship. A vessel is a peaceful ship spotting platform for ships passing by and docking nearby. The ship we boarded was the Fiji-I of the South Pacific Transport Corp. It was a cruiser ship built locally in a shipyard (the Fortune ShipWorks in Tayud) that is also controlled by its owners. The crew not sleeping were friendly and welcoming and they let us free roam of the bridge and we were also able to view the engines. It is just like old times when ships and crew didn’t treat people they didn’t know as potential terrorists or saboteurs. Actually it is only the USA which is too squeamish of people in contact with ships because people there commit massacres every now and then. That kind of violence is completely unknown in our country. Deadly psychopaths are only concentrated in the USA. We then decided to end our ship spotting activity. Hunger and thirst were already catching up on us and we needed to refill ourselves. And so we hied off to our breakfast with the guards wondering from what ship we came from as there is no new arrival. All in all it was a good ship spotting adventure. We were able to experience “Bridge Class” in a SuperCat, enjoyed Tagbilaran hospitality with plenty of food and good stories and we were lucky we did not sleep over in the pier and we had a free dormitory-type hotel room that was sailing at sea that brought us back to Cebu again. If some will think that was the end of our Tagbilaran adventures, nope. We had another visit but as they say that is a different story. Abangan!